It’s that time of year when people are hauling tangled wires from attics and basements and lighting up their home for the holidays. If you want to save money on your electrical bill and make sure your light show turns on at the start of sunset, use electric timers to program your lights. But electric timers aren’t just for lights. From hot tubs and pools to Christmas lights to light switches, timers are a versatile and convenient way to control all your lights and circuits. Timers can be a great way to increase convenience, safety, and home security. You can use them to save energy, give the appearance that somebody is home, and shut off the hot tub or sauna if you fall asleep. Learn about the different types of electric timers and which ones would make your life easier. The two main types of light timers are mechanical and electronic, and come as hardwired or plug-in modules. The other two timers—astronomic and photocell—are really types of electronic timers, but we have separated them since they are so different. Timer light switches can replace your standard switch by simply installing the timer switch in the same electrical box. Manual, analog timers are very similar to setting a watch or using the time knob on a toaster oven. The spring-loaded mechanical design keeps track of the time. Some give you the option to set as many on/off periods as you want within a 24-hour period. Other timers limit the operating time to a maximum of 60 minutes. The mechanical design ensures that the circuit will be completely cut off at the end of the specified time. Mechanical timers are durable, reliable, and convenient. Due to their strength and simplicity, mechanical, spring-wound timers are often used for lights, ceiling fans, appliances, bathroom heat lamps, saunas, hot tubs, and pools. The programmable timers allow you to set the switch to turn on and off at specific times. They are similar to some mechanical timers since they can have multiple on/off cycles in a 24-hour period, but they can be scheduled for more than one day. 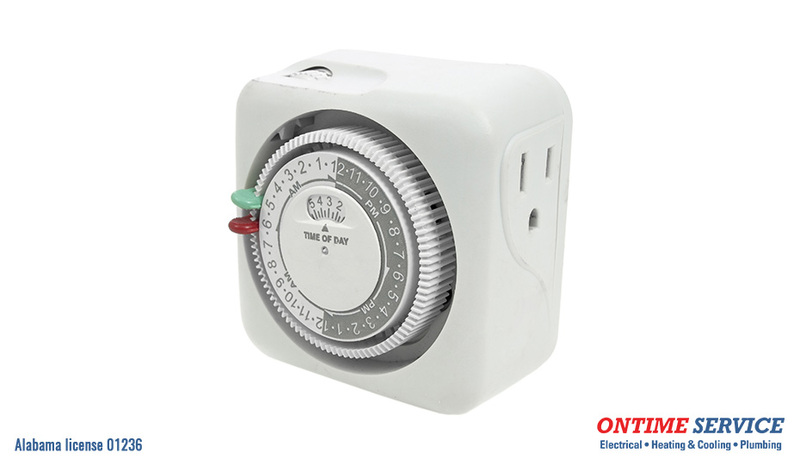 Similar to a programmable thermostat, you can set a 7-day schedule with the exact on/off times. There are also “smart” digital timers available that allow you to use your smartphone as a remote control device to set timers, turn lights on/off, and more. Many can pair with Alexa or Google Home for voice control. You can purchase a light timer at your local home improvement store for around $30. They are easy to set up and are more effective than simply leaving a light on or two. We highly recommend setting your lights and TV to light timers while away on vacation. Astronomic timers are a form of digital timers, but they have built-in programming that calculates the sun’s rise and set times. This makes it better for more accurate nighttime illumination. Astronomic timers adjust for the day’s sunrise and sunset times without a separate photocell device. Many models come with remote control. In addition to astronomic timers, there are also photocell models that distinguish day from night using light-gathering sensors. Keep in mind that photocell timers may not work properly if there is a lot of ambient light in your neighborhood. There are many different types of electric timers used to fit a variety of applications. There are water heater timers, sprinkler/irrigation timers, pool/spa timers, aquarium timers, and much more. While most indoor and outdoor timers will work with your Christmas lights, make sure you read the manufacturer instructions. Check the maximum wattage or amperage capacity. Do NOT exceed the maximum wattage rating of the timer. If it is a plug-in timer and there are multiple outlets, add up the wattage of everything that is plugged in. It’s a good idea to get heavy-duty, outdoor-rated timers rated for at least 15 amps (1800 watts). All lights or electrical equipment should be inspected by an independent testing laboratory, such as Underwriters Laboratory (UL). It’s also a good idea to set your indoor Christmas lights on a schedule to save energy and reduce the risk of a fire. For small devices inside, plug-in wall timers are a good choice. Some lights and electrical devices may not work with any old timer. Speak with the experts at OnTime Service for more information of light timers. Learn more winter electrical safety here. Contact OnTime Service at 205-942-1405 for your next electrical, plumbing, or HVAC appointment. Sign up for our Super Service Club for lifetime warranties, exclusive discounts, and much more.